Boris I or sometimes Boris-Mihail (Michael) (Bulgarian: Борис I (Михаил)), also known as Bogoris (died May 2, 907) was the ruler of Bulgaria 852–889. At the time of his baptism in 864, Boris was named Michael after his godfather, Emperor Michael III. Boris inherited a large territory that was home to both Bulgars and Slavs. While his military campaigns against the Serbs were unsuccessful, he later turned to Eastern Orthodox Christianity, and was the first Bulgarian ruler to be baptized. He supported the missionaries, Saints Cyril and Methodius, who arrived in Belgrade and helped to set the foundations for the Cyrillic alphabet and Bulgarian Christian culture. His embrace of Christianity may have been his attempt to unite the disparate groups of his khanate through the embrace of a single religion, although his embrace of Christianity resulted in a pagan rebellion which he successfully put down. He abdicated his reign in 889 and entered monastic life, but later left to help remove his son Vladimir from the throne in 893, and replace him with his son Simeon. His long reign also witnessed the advent of Slavonic literature and the establishment of the first centers of Slav-Bulgarian education. Boris' actions would be instrumental in uniting the Bulgarian ethnic community. He was canonized by the Orthodox Church. After the official act of conversion to Christianity Boris adopted the Christian name Michael. He is sometimes called Boris-Michael in historical research. The only direct evidence of Boris's title are his seals and the inscription found near the town of Ballsh, modern Albania, and at Varna. There he is called with the Byzantine title "Archon of Bulgaria," which is usually translated as "ruler." In the 10th and 11th centuries he is also referred to as "Knyaz." In the Bulgarian sources from that period Boris I is called "Knyaz" and during the Second Bulgarian Empire as "Tsar." In modern historiography Boris is called with different titles. Most historians accept that he changed his title after the conversion to Christianity. According to them before the baptism he had the title Han or Khan , and after that Knyaz or Tsar. According to another theory the title Knyaz was used by the Bulgarian rulers since the reign of Asparukh. From the beginning of the ninth century a fierce rivalry commenced between the Eastern Orthodox Church in Constantinople and the Catholic Church in Rome. When Charlemagne was proclaimed Emperor of the Holy Roman Empire the Pope broke its political relation with Byzantium and was naturally supported by the Franks. After the Treaty of Verdun in 843 the strong and aggressive Eastern Francia united most of the German people and began to expand towards Slavic populated lands to the east. That expansion was fully supported by Rome which sought ways to extend its influence to the east. As a response Mojmír I managed to unite some Slavic princes and formed Great Moravia in 833. His successor Rastislav fought against the Germans. Both states tried to maintain good relations with Bulgaria on account of its considerable military power. Boris I was the son and successor of Presian I of Bulgaria, who was the ruler of Bulgaria from 836–852. Presian's reign apparently coincided with the extension of Bulgarian control over the Slavic tribes in and around Macedonia. However, Presian's campaigns against the Serbs in about 839–842 failed miserably. By the end of Presian's reign Serbia and Bulgaria lived in an uneasy peace. In 852 Boris sent emissaries to the Eastern Francia to confirm the peace treaty from 845., At the time of his accession he threatened the Byzantines with an invasion but his armies did not attack and received a small area in Strandzha to the south-east. The peace treaty, however, was not signed although both states exchanged a temporary delegation. In 854 the Moravian Prince Rastislav persuaded Boris I to help him against East Francia. According to some sources, some Franks bribed the Bulgarian monarch to attack Louis. The Bulgarian-Slav campaign was a disaster and Louis the German, a grandson of Holy Roman Emperor Charlemagne, scored a great victory and invaded Bulgaria. At the same time the Croats waged a war against the Bulgarians. Both peoples had coexisted peacefully to that moment which suggests that the Croats were paid by Louis to attack Bulgaria and distract Boris' attention from his alliance with Great Moravia. Kanasubigi Boris could not achieve any success so the both sides exchanged gifts and settled peace. As a result of the military actions in 855 the peace between Bulgaria and Eastern Francia was restored and Rastislav was forced to fight against Louis alone. After the death of Vlastimir of Rascia (c. 850) the state was divided between his sons. Boris desired to take the opportunity and restore his positions after the unsuccessful actions against the Croats and invaded Rascia. The main aim was to replace the Byzantine influence over the small Slavic state with Bulgarian one but he was defeated once more: the Serbs captured his son Vladimir-Hrasate and twelve great boyars., Boris who was concerned for his son signed peace and gifted the Serbs. In spite of various reverses, Boris succeeded in maintaining the territorial integrity of his realm. For a variety of reasons, Boris became interested in converting to Christianity and undertook to do that at the hands of western clergymen to be supplied by Louis the German in 863. However, late in the same year, the Byzantine Empire invaded Bulgaria during a period of famine and natural disasters. Taken by surprise, Boris was forced to sue for peace and agreed to convert to Christianity according to the eastern rites in exchange for peace and territorial concessions in Thrace. 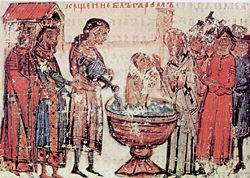 At the beginning of 864 Boris was secretly baptized at Pliska by an embassy of Byzantine clergymen, together with his family and select members of the Bulgarian nobility. 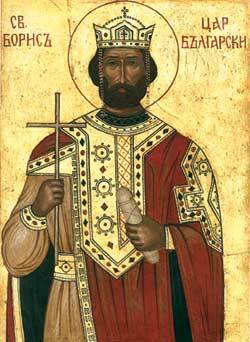 With Emperor Michael III as his godfather, Boris also adopted the Christian name Michael. Boris' conversion inspired a reaction by his pagan subjects, including many important notables. There are a few differing versions about why Boris converted to Christianity. Some historians attribute it to the intervention of his sister who had already converted while she stayed at Constantinople. Another story mentions a Greek slave in the ruler's court. A more mythological version is the one in which Boris is astonished and frightened by an icon of Judgment day and thus decides to adopt Christianity. His conversion to Christianity met great opposition in Bulgaria. In the summer of 855 a group of aristocrats (boyars) started an open revolt. Boris ruthlessly suppressed it and executed 52 boyars together with their entire families. Thus the Christianization continued. At the same time Boris sought further instruction on how to lead a Christian lifestyle and society and how to set up an autocephalous church from the Byzantine Patriarch Photios. Photios' answer proved less than satisfactory, and Boris sought to gain a more favorable settlement from the Papacy. Boris dispatched emissaires with a long list of questions to Pope Nicholas I at Rome in August 866, obtaining 106 answers detailing the essence of religion, law, politics, customs and personal faith. The pope temporarily glossed over the controversial question of the autocephalous status desired by Boris for his church and sent a large group of missionaries to continue the conversion of Bulgaria in accordance with the western rite. Bulgaria's shift towards the Papacy infuriated Patriarch Photios who wrote an encyclical to the eastern clergy in 867, in which he denounced the practices associated with the western rite and Rome's ecclesiastical intervention in Bulgaria. This occasioned the Photian Schism, which was a major step in the rift between the eastern and western churches. In Bulgaria the activities of the papal legate Bishop Formosus (later Pope Formosus) met with success, until the pope rejected Boris' request to nominate Formosus archbishop of Bulgaria. The new Pope Adrian II refused Boris' request for a similar nomination of either Formosus or Deacon Marinus (later Pope Marinus I), after which Bulgaria began to shift towards Constantinople once again. At the Fourth Council of Constantinople in 870 the position of the Bulgarian church was reopened by Bulgarian envoys, and the eastern patriarchs adjudicated in favor of Constantinople. This determined the future of the Bulgarian Orthodox Church, which was granted the status of an autocephalous archbishopric by the Patriarchate of Constantinople. Later in the 870s the Patriarch of Constantinople surrendered Bulgaria to the Papacy, but this concession was purely nominal, as it did not affect the actual position of Bulgaria's autocephalous church. In 886 Boris' governor of Belgrade welcomed the disciples of Saints Cyril and Methodius, who were exiled from Great Moravia into Bulgaria and sent them on to Boris in Pliska. Two of these disciples, Clement of Ohrid and Naum of Preslav who were of noble Bulgarian origin, set up educational centers in Pliska and in Ohrid to further the development of Slavonic letters and liturgy. The alphabet that was originally developed by Cyril and Methodius is known as the Glagolitic alphabet. In Bulgaria Clement of Ohrid and Naum of Preslav however created (or rather compiled) a new alphabet which was called Cyrillic and was declared the official alphabet of the Bulgarian language during an assembly in 893. In the following centuries this alphabet was adopted by other Slavic peoples. The introduction of Slavic liturgy paralleled Boris' continued development of churches and monasteries throughout his realm. In 889 Boris abdicated the throne and became a monk. His son and successor Vladimir attempted a pagan reaction, which brought Boris out of retirement in 893. 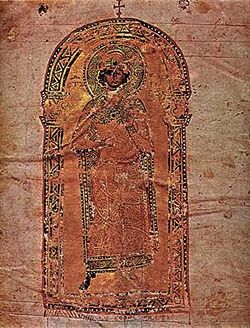 Vladimir was defeated and blinded, and Boris placed his third son, Simeon I of Bulgaria on the throne, threatening him with the same fate if he too apostatized. Boris returned to his monastery, emerging once again in c. 895 to help Simeon fight the Magyars, who had invaded Bulgaria in alliance with the Byzantines. After the passing of this crisis, Boris resumed monastic life and died in 907. The location of his retreat, where perhaps he was interred, is not certain; it may be near Preslav but also in Pliska or in a monastery near Varna or Ravna. Saint Boris Peak on Livingston Island in the South Shetland Islands, Antarctica is named for Boris I of Bulgaria. During the reign of Boris I, Bulgaria accepted Eastern Orthodox Christianity. and became a major European power while fighting with the Byzantine Empire for the control of the Balkans. During his reign, the Cyrillic alphabet originated in Preslav and Ohrid, adapted from the Glagolitic alphabet invented by the monks Saints Cyril and Methodius. The Cyrillic alphabet became the basis for further cultural development. Centuries later, this alphabet, along with the Old Bulgarian language, fostered the intellectual written language (lingua franca) for Eastern Europe, known as Church Slavonic. Boris' reign would set the stage for further territorial extension of the Bulgarian Empire —covering most of the Balkans —under Simeon I, the first Bulgarian Tsar (Emperor), son of Boris I. Under Simeon Bulgaria developed a rich, unique Christian Slavonic culture, which became an example for the other Slavonic peoples in Eastern Europe and ensured the continued existence of the Bulgarian nation regardless of the centrifugal forces that threatened to tear it into pieces throughout its long and war-ridden history. ↑ Who's Who in Medieval History,  Retrieved September 24, 2008. ↑ F. Raçki, Documenta historiae Chroatie etc., (Zagreb, 1877), 359. ↑ Georgius Monachus Continuatus. Logomete. ↑ John V.A. Fine, Jr. The Early Medieval Balkans: A Critical Survey from the Sixth to the Late Twelfth Century. (Ann Arbor, MI: University of Michigan Press,  1991), 144-148. History of "Boris I of Bulgaria"
This page was last modified on 20 June 2016, at 18:08.